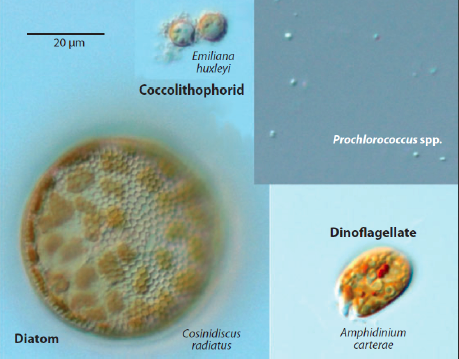 ﻿﻿﻿﻿Phytoplankton comes in all different shapes and sizes. Microalgae have the potential to revolutionize biotechnology in a number of areas including nutrition, aquaculture, pharmaceuticals, and biofuels. Although algae have been commercially cultivated for over 50 years, metabolic engineering now seems necessary in order to achieve their full processing capabilities. Recently, the development of a number of transgenic algal strains boasting recombinant protein expression, engineered photosynthesis, and enhanced metabolism encourage the prospects of designer microalgae. Given the vast contributions that these solar-powered, carbon dioxide-sequestering organisms can provide to current global markets and the environment, an intensified focus on microalgal biotechnology is warranted. Ongoing advances in cultivation techniques coupled with genetic manipulation of crucial metabolic networks will further promote microalgae as an attractive platform for the production of numerous high-value compounds. Microalgae are unique because they combine the renewable energy-capturing ability of photosynthesis with the high yields of controlled microbial cultivation, making them potentially valuable organisms for economical, industrial-scale production processes in the 21st century (1). ﻿﻿﻿Energy content﻿ ﻿﻿- Different substances contain different amounts of potential energy, that is, the ability to do work. To extract energy from a substance, a process must convert the substance into another state, releasing the potential energy as kinetic energy in the process, usually in the form of heat. Most man-made machines for harnessing this energy then convert the heat released into mechanical energy (such as a spinning turbine), then finally into electrical energy if needed, using a generator. The proportion of energy usefully captured and converted into mechanical or electrical form is called its ﻿efficiency﻿. No machines are 100% efficient. Thus the amount of useful work actually performed by these substances upon processing will never equal their potential energy content. Furthermore, the mass and volume of a substance contributes to overhead energy costs for producing, processing, shipping, and storing of the substance required to utilize it as a fuel. When calculating economic or environmental impact of a particular fuel, all of these factors must be considered holistically. ﻿Compressed natural gas (CNG) ﻿(Methane stored at high pressure) can be used in place of gasoline (petrol), Diesel fuel and propane/LPG (liquified petroleum gas). CNG combustion produces fewer undesirable gases than the fuels mentioned above. It is safer than other fuels in the event of a spill, because natural gas is lighter than air and disperses quickly when released (see other advantages). CNG may be found above oil deposits, or may be collected from landfills or wastewater treatment plants where it is known as biogas. CNG is made by compressing natural gas (which is mainly composed of methane, CH4), to less than 1 percent of the volume it occupies at standard atmospheric pressure. It is stored and distributed in hard containers at a pressure of 200–248 bar (2,900–3,600 psi), usually in cylindrical or spherical shapes. Dry plant matter, lignocellulose is the most abundant raw material in the world for the production of ethanol by fermentation, and many biofuels are made using the oils from crops such as corn or soya beans. Yet the displacement effect of using land crops for fuel production instead of food arguably causes more carbon emissions via deforestation and can drive up food prices. Oliver Chadwick, from the Department for Transport, says some models suggest that in terms of emissions it can actually be worse than using crude oil. "To provide biofuel for one lane of cars requires a strip of land the length of that lane, and 8 km wide," he says. "Conventional biomass is just not efficient in terms of land use." This is where algae come in. Some species of microalgae can convert up to 60% of their biomass to oils (compared to 2-3% in soy beans). Because they do not produce complex differentiated tissues such as stems and leaves, algae grow faster than crops. Plus, marine macroalgae do not even have to be grown on land. Source: Tom Ireland - Society of Biology - The Biologist Vol 61(1) p20-24. ﻿Biodiesel fu﻿el: The carbon chain length and degree of unsaturation of the fatty acids in each microalgal species can affect the cold flow and oxidative stability properties of a biodiesel fuel which is derived from this feedstock. Typically, most microalgal fatty acids have a chain length between 14 and 20; major species are often 16:1, 16:0, and 18:1. Ideal fatty acids for diesel production should be 12:0 and 14:0. The chain lengths of fatty acids are determined by acyl-ACP thioesterases, which release the fatty acid chain from the fatty acid synthase. ﻿﻿Cetane number ﻿﻿or CN is a measurement of the combustion quality of diesel fuel during compression ignition. Thus, it is the approximate equivalent of octane rating for gasoline (petrol). The CN is an important factor in determining the quality of diesel fuel, but not the only one; other measurements of diesel's quality include density, lubricity, cold-flow properties and sulphur content. More precisely, CN is a measure of a fuel's ignition delay, the time period between the start of injection and the first identifiable pressure increase during combustion of the fuel. In a particular diesel engine, higher cetane fuels will have shorter ignition delay periods than lower cetane fuels. Cetane numbers are only used for the relatively light distillate diesel oils. For heavy (residual) fuel oil two other scales are used: CCAI and CII. In short, the higher the cetane number the more easily the fuel will combust in a compression setting (such as a diesel engine). The characteristic diesel "knock" occurs when the first portion of fuel that has been injected into the cylinder suddenly ignites after an initial delay. Minimizing this delay results in less unburned fuel in the cylinder at the beginning and less intense knock. Therefore higher-cetane fuel usually causes an engine to run more smoothly and quietly. This does not necessarily translate into greater efficiency, although it may in certain engines. Biodiesel from vegetable oil sources have been recorded as having a cetane number range of 46 to 52, and animal-fat based biodiesels cetane numbers range from 56 to 60. Dimethyl ether is a potential diesel fuel as it has a high cetane rating (55-60) and can be produced as a biofuel. Rosenberg, J. N., Oyler, G. a, Wilkinson, L., & Betenbaugh, M. J. (2008). A green light for engineered algae: redirecting metabolism to fuel a biotechnology revolution. Current Opinion in Biotechnology, 19(5), 430–6. The basis of this table and associated references was taken from: American Petroleum Institute (API), Alcohols and Ethers, Publication No. 4261, 3rd ed. “Alcohols: A Technical Assessment of Their Application as Motor Fuels,” API Publication No. 4261, July 1976. Petroleum Product Surveys, Motor Gasoline, Summer 1986, Winter 1986/1987, National Institute for Petroleum and Energy Research. “Status of Alcohol Fuels Utilization Technology for Highway Transportation: A 1981 Perspective,” Vol. 1, Spark-Ignition Engine, May 1982, DOE/CE-56051-7. J. Tuttle and T. von Kuegelgen, Biodiesel Handling and Use Guidelines--Third Edition, National Renewable Energy Laboratory, 2004. Handbook of Chemistry and Physics, 62nd Edition, 1981, The Chemical Rubber Company Press, Inc.
API Technical Data Book – Petroleum Refining, Volume I, Chapter I. Revised Chapter 1 to First, Second, Third and Fourth Editions, 1988. “Data Compilation Tables of Properties of Pure Compounds,” Design Institute for Physical Property Data, American Institute of Chemical Engineers, New York, 1984. (k) API Monograph Series, Publication 723, “Teri-Butyl Methyl Ether,” 1984. Praxair, Inc. Material Safety Data Sheets for Propane, CNG, and Hydrogen. September 2004. Danbury, CT USA. Value at 80 degrees F with respect to the water at 60 degrees F (Mueller & Associates). C. Borusbay and T. Nejat Veziroglu, “Hydrogen as a Fuel for Spark Ignition Engines,” Alternative Energy Sources VIII, Volume 2, Research and Development (New York: Hemisphere Publishing Corporation, 1989), pp. 559-560. Technical Data Book, Prepared by Gulf Research and Development Company, Pittsburgh, PA, 1962. National Biodiesel Board,, "Biodesel Fact Sheet Fact Sheet", accessed at www..biodiesel.org.au/biodieselfacts.htm on 11-20-06. www biodiesel.org au/biodieselfacts.htm on 11 20 Sources: (Washington, DC, June 2001), Table B-1.